Redeem has the industry buzzing after he brought $50,000 at Jensen Bros. 2011 Fall Sale, selling to Hoffman Ranch, Churchill Cattle, and Delaney Herefords. Two full sisters combined to bring $38,000 as well. Redeem transmits extra body and rib dimension and he's passing this as well as great udder quality onto his daughters. 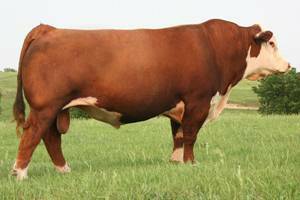 Redeem is homozygous polled.